We’ve helped system integrators uncover more than $120 million in credits. alliantgroup’s mission is one of education and awareness—we exist to help industry organizations, U.S. businesses and the CPA firms that advise them, take full advantage of all federal and state tax credits, incentives and deductions available to them. Our government has legislated these powerful incentive programs to help businesses grow and successfully compete both in the U.S. and abroad. We are proud to have helped over 20,000 businesses claim more than $5 billion in tax incentives. 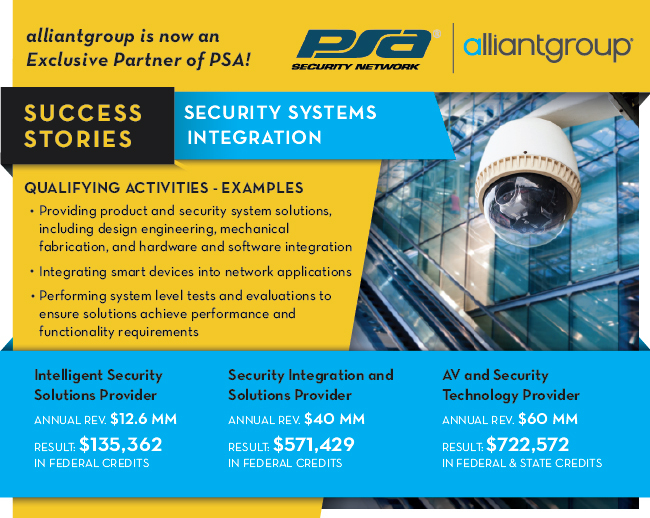 alliantgroup’s headquarters is in Houston, Texas, with offices across the country including New York, Boston, Chicago, Orange County, Sacramento, Orlando, Indianapolis and Washington, D.C. To learn more about this partnership, please click the link to view the press release.